The cancer is gone. 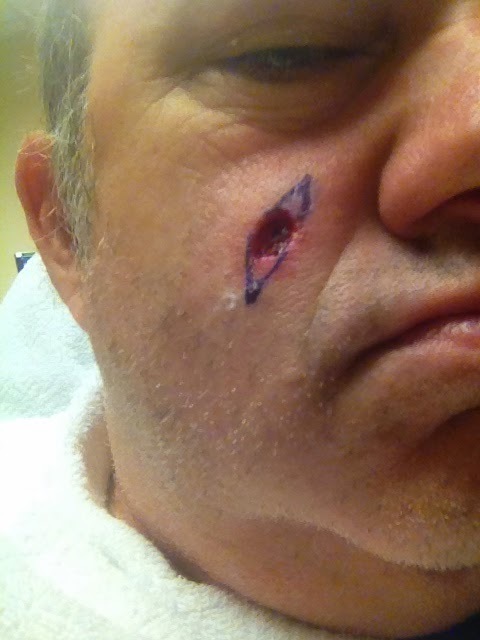 On Thursday September 4 the surgeon cut it out leaving an oval hole in my cheek. 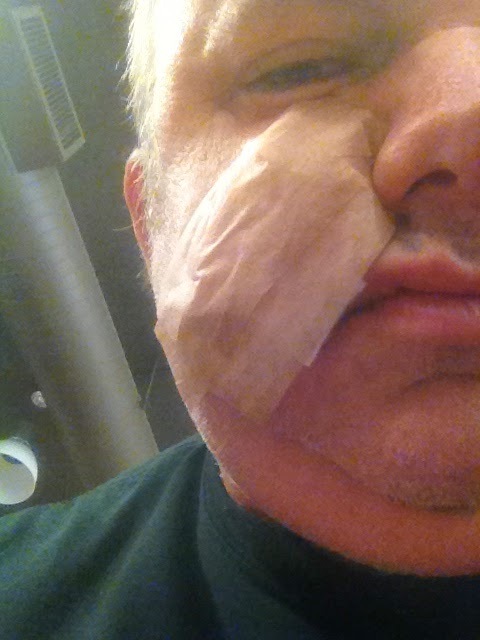 They placed a temporary bandage over the hole and showed me to an interior waiting room. There I attempted to read my yoga book, but couldn’t help listening to all the war stories. some Sharpie marks for additional cutting. Four other patients there–all with skin cancer made me feel I not only was not alone, but was quite lucky. The was the one woman who lost most of an ear and was hear for a procedure on her neck. There was the woman with cling wrap on her face similar to what was on my arms some years ago. My guess is she had the same solution on her face that I had on my arms, as if being marinated. If that was true it was the prep for Photodynamic Therapy, where she would later spend time under an array of lights. It didn’t work for me unfortunately. Hopefully, it worked for her. The star of the show was a man in his sixties with his wife. Throughout my hour waiting for the doctor to check the margins of the cancer they cut out of me I listened to this poor man with a champion’s spirit. He had part of his eyelid removed, one eye brow missing, skin from his arms, one of his leg, and a nine-inch strip of skin taking from his back. I really did try to read so I don’t know if some of these parts removed where to graphed in the affected places. When the nurse came for him he said in a joking manner, “the doc wants another pound of flesh, eh?” Wow! If I could only have that attitude. When I got back on the operating table (actually a chair similar to ones used by dental hygienists) they cut more flesh above and below the oval divot so the wound would not “pucker.” Then they sewed me up. Before the whole procedure I agreed to a “scar study.” The doctor used two different methods of sewing me up–the top half differing from the bottom. The idea was to prove a theory that a single stitch will work just as well as a double would. I asked why should I do it. His answer, “For science.” Good enough for me. Besides, I’m not the most attractive man on the planet. Who cares if the scar ended up looking weird. 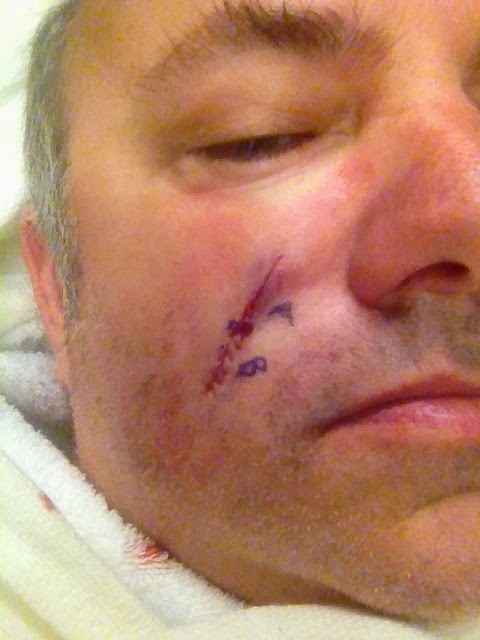 They finished me off with a pressure dressing that I kept on for twenty four hours. I also had to sleep elevated. The first thing I did when I left the clinic was order a House sandwich from Roxie Deli across the street. It was a challenge stuffing that huge sandwich through my pie hole with that pressure dressing partly in the way, but I managed! like for over a week! 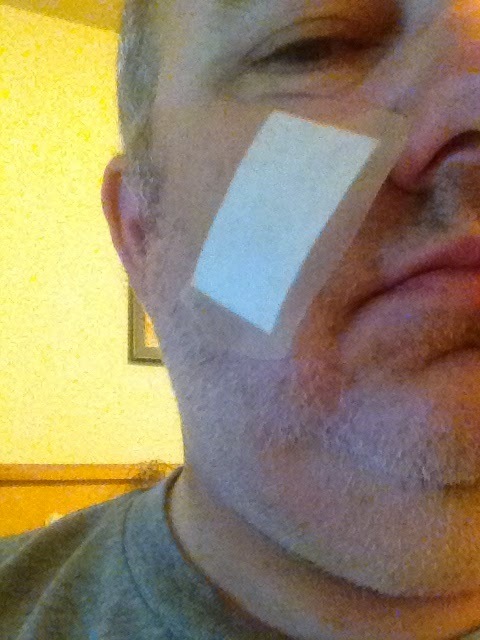 That dressing was finally replaced with a conventional bandage, which was far easier to manage. I need to wear this type of bandage for nine additional days, but here is the double drag, if you don’t mind me borrowing an old Prince adage: no bicycling or yoga for ten days! This is maddening. I first figured I would be able to manage my weight during that time by cutting way down on my food intake, but three days into this trial and I am failing miserably. I may just toss the idea of maintaining my weight and do a tuck and roll off the wagon. I can start over after September 15. In the meantime, stay positive! ‹ PreviousHogan, where are you going with that double-chin?